2013, December: Panel to rationalize various skill Development schemes. It gave report in 2014, October. Relevance: GS Mains 2: Government policies and interventions for development in various sectors and issues arising out of their design and implementation. It will be a funny and fruitful exercise if you replace the word “skill/skill development” in the below article and substitute with any other word like “poverty / unemployment / rural /education / nutrition / healthcare”. Then same fodder can be applied to variety of questions and essay. S.Ramdorai, The chairman of NSDA- National Skill Development agency. Mind it- NSDA and not NSDC. Total 22 ministries running parallel schemes for Skill development- textile, commerce, HRD, labour and so on. Each of them has different norms for eligibility criteria, training duration, scholarship/subsidy to beneficiary, outcomes, monitoring and tracking mechanism. This leads to Resource wastage, while some beneficiaries get multiple benefits for undergoing same type of training. Third, give cash funding only based on the outcomes. Fourth, motivate both trainer and the trainee. Fifth- monitor the beneficiaries of all the “Rajiv Gandhi skill LELO yojanas”. Gives training to fresh entrants / no0bs so they became sellable in labor market. Give them minimum 200 hours of training. upgrading skill of a person already doing some job / business. Give’em minimum 80 hours of training. Recognition Giving paper degrees and fancy certificates to skilled person. College Running formal education courses like diplomas and degrees. 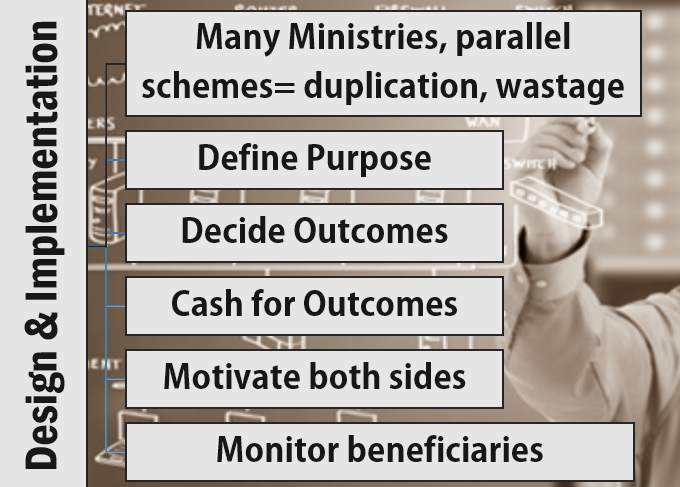 If a given scheme is not doing ONE of the FOUR things listed above, then it’s not a skill Development scheme. In case, you are wondering how can we play “word-replacement” game on this? Well, “Defining” a parameter has always been a controversial exercise. Recall the new Poverty line design by Rangarajan and how the NATION (Arnab Goswami) and RANGA (the villain) were unhappy because of that. Same goes for defining malnutrition, Education under Sarva Sikha Abhiyan, “productive assets” under MNREGA and so on. How many people got training? Did the person get job after training? If a person was already in job/business, then, after getting training in our scheme, whether his income increase or not? How can we play “word-replacement” game in this? Consider education scheme Sarva Siksha Abhiyan. It measures outcomes on “how many teacher employed, no. of students enrolled, no. of buildings constructed”. But a rational outcome can measured from NGO Pratham’s survey i.e. can a 5th Standard kid read a textbook and solve math sums of 2nd standard or not? Panel recommends- first do a “time study” and “cost study” of the given training program. Government should release the fund money based on OUTCOMES. e.g. 100 people trained but only 50 got job, then funding= 50 people x cost per person x no. of training hours. Result: cost cut down and fiscal deficit reduced. This cost-cutting formula will not apply to Home ministry’s UDAAN Scheme for J&K youth training. Because its main purpose is ‘national-integration’. Trainer /teacher will Rs. 3000 bonus if 70% of his batch-students achieve the outcomes. Rs. 5,000 bonus, if 90% of students achieve outcomes. This will motivate the trainers to focus more on the individual beneficiaries. This type of incentives already present in healthcare sector e.g. ASHA-workers get additional bonus for Vasectomy, DOTS program and on. But, we can adopt the same for school Teachers under Sarva Siksha Abhiyan, if 70% or 90% of their students pass Pratham’s test, teacher get salary bonus. Panel says, beneficiary must be give minimum 1,000 rupees security deposit. It’ll be refunded at the end of program. This will ensure only “Serious players” join the program, attend all lectures, learn the concepts and make handwritten notes seriously. Although hard to adopt in other sectors e.g. asking BPL family to give refundable deposit before their kid joins a posh school under 25% reservation quota under right to education act. OR asking a TB patient to deposit 1000 rupees to ensure he takes DOTS pills on regular basis! “March rush”: from April to December laziness. From January to March suddenly the ministries will run dozens of camps and seminars to spend money in haste, before 31st March comes. Same person getting multiple training /scholarship from multiple ministries for similar type of training. Therefore, panel says we must setup Management Information System(MIS) and Adhar cards to track beneficiaries and their careers. Now, Take this as a framework answer to any of the questions asked on social schemes- how to fix its design and implementation! 100% Government owned Autonomous body. Earlier this was Prime minister’s national council on skill development (PMNCSD). Advisory and Coordination work for Union, States, NSDC, international donors and private companies. Run national database for labor market information. Give skill training to 150 million Indians by 2022. Some websites say 500 million. But Actual target to cover 30% of the 500 million people by 2022. So 0.3 x 500=150 million. Discuss the problem areas in the design and implementation of Skill development schemes in India. List the necessary modifications in them to reap full demographic dividend. 200 words. Same question for education, healthcare, handicraft, tribal-Development and other sectors. Nice compilation sir ji, when will be enlighten our knowledge abt black money? If possible provide some matter on issues related to patent. this type of article is execepted from u ? article which are not comprehensive on conventional books and even coaching industry did blah blah on certain topics ..
and in this blog u choose that kind topics and handle neatly . this article definitely value addition. Thks mrunal…this was an eye opener …btw mrunal auto correct = manual ! !